Supporters of presidential candidate Maryse Narcisse, from Fanmi Lavalas political party, chant victory slogans during a protest in Port-au-Prince, Haiti, Nov. 28, 2016. 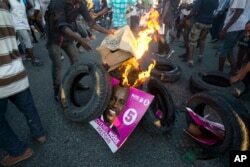 Protests and celebrations rippled through Haiti on Tuesday, as losing candidates rejected preliminary results of an election that indicated banana exporter Jovenel Moise would be the next president. Moise, who ran for former President Michel Martelly's Bald Heads Party, won with 55.67 percent of votes cast in the November 20 election, the electoral council said Monday. The result made a second-round runoff next year unnecessary. Police used tear gas on protesters in the La Saline neighborhood, a stronghold of Fanmi Lavalas, the leftist party of former President Jean-Bertrand Aristide. It called the results an "electoral coup." The U.S. Embassy issued reports of demonstrations, gunshots and burning tires in downtown Port-au-Prince and Malpasse, a town close to the border with the Dominican Republic. Supporters of presidential candidate Maryse Narcisse, from the Fanmi Lavalas political party, burn tires and a campaign poster of rival candidate Jovenel Moise, from the PHTK party, in Port-au-Prince, Haiti, Nov. 28, 2016. 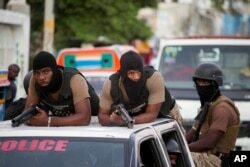 A spokesman for the Haitian national police said it was responding to protests in La Saline but could not confirm whether protests in Malpasse had taken place. Moise, the front-runner in a scrapped election last year, said, "We salute those who voted for me and those who did not vote for me. We are going to use the people, the sun, the land and water to develop the country." In the upscale Port-au-Prince suburb of Petionville, residents danced and cheered the result. Elsewhere in the city, in the neighborhood of Pacot, Moise's supporters took to the streets in a small parade, accompanied by celebratory gunshots. Jude Celestin, a mechanical engineer who had led a government construction firm, came in second. He received just under a fifth of the vote. Moise Jean-Charles, a leftist senator, netted 11 percent, while Maryse Narcisse, running for Aristide's Fanmi Lavalas party, won around 9 percent, the preliminary results showed. The Organization of American States, which had been among the international observers of the election, said the results corresponded with its data. National police ride behind demonstrators as they keep an eye on the protest in Port-au-Prince, Haiti, Nov. 28, 2016. However, turnout was low and 10 percent of sheets tallying votes were thrown out because of irregularities. In a country of 10 million people, Jovenel Moise received just 600,000 votes. Three people on the nine-member electoral council did not sign the report declaring Moise the winner, although the council's president did not say who had abstained. Those elements fueled a universal condemnation of the results from the losing candidates, who have 72 hours to contest before the final results are released December 29. "We reject the results because they are invalid votes that have been counted," said Michel Andre, a lawyer for second-place finisher Celestin. "Jude Celestin will challenge the results." Moise Jean-Charles also Tuesday that he would fight the results. "The outcome of the election is the result of a conspiracy by the economic oligarchy and sectors of the international community," he said.